This tutorial will cover how to use the Magic Wand, Instant Alpha Eraser, Blending Modes, and Filters to remove the background of an image. You can also check out this video tutorial created by MacMost. 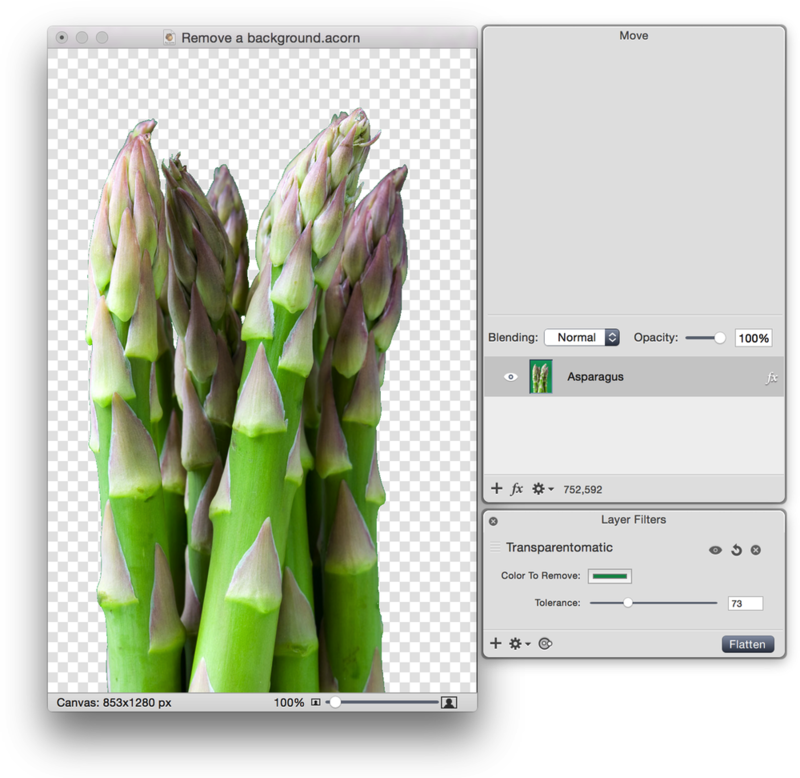 The original image in this example is asparagus with a green background. The goal is to remove the green background. Select the magic wand in the tools palette. Notice in the inspector palette there is a field labeled Wand Tolerance. This number adjusts the range of colors that the magic wand will select. To remove all of the green background seen here and not just sections of it, a tolerance of around 60 should work. 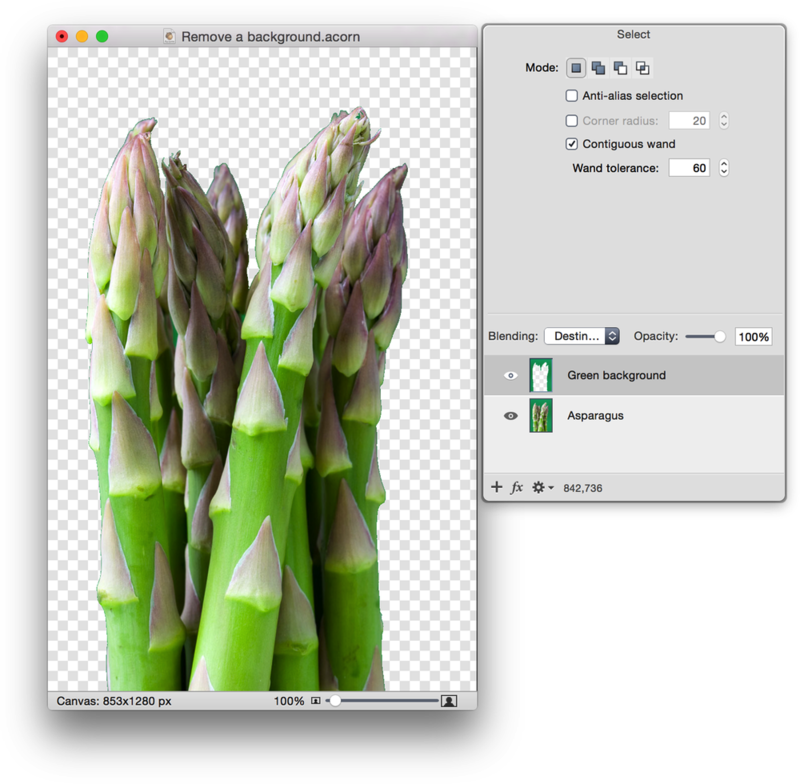 Using the magic wand, select the green background. You can tell the background has been selected by all of the little ants marching around it. 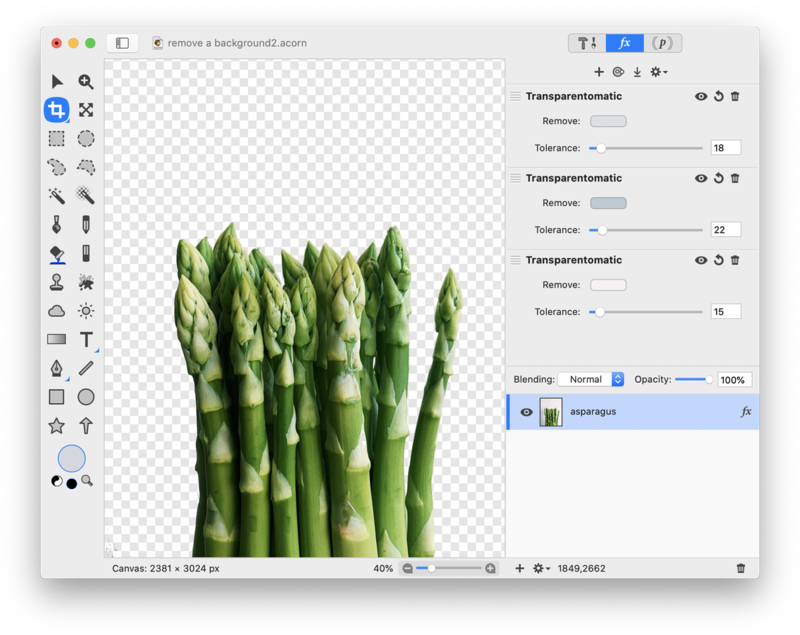 Another option for fully selecting the background is to use the magic wand tool and place your cursor over the background. Then click and drag with the mouse to increase or decrease the tolerance of the selection. You will see a circle near your cursor increase or decrease in size in response to the change in tolerance. You can see in real time how your selection grows or shrinks. The first image below shows an appropriate selection of the green background. 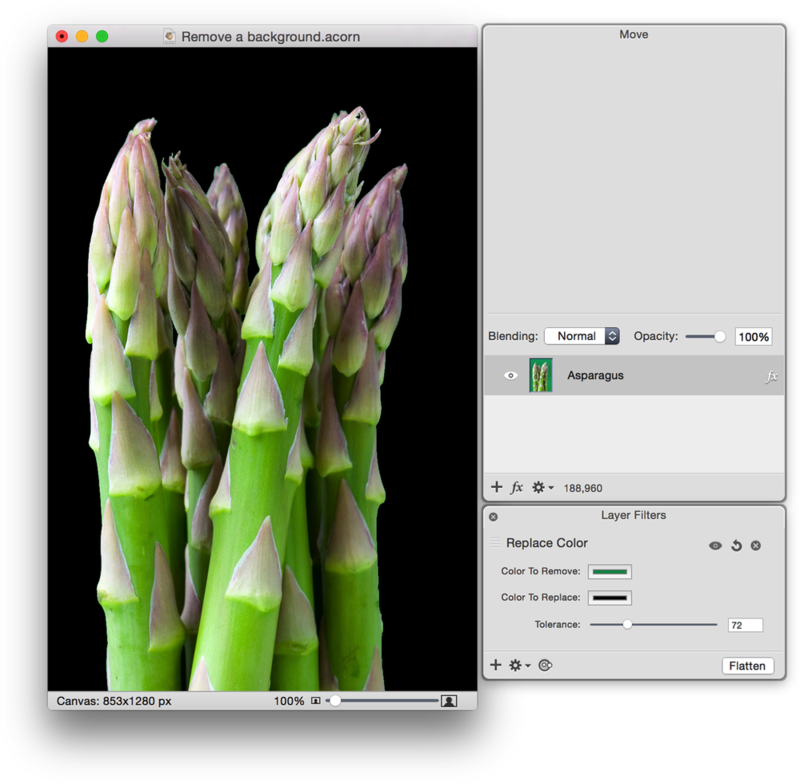 The second image shows the wand has selected too much and is overflowing into the asparagus. Now hit the Delete key and deselect by going to Select ▸ Clear Selection (⌘D). You can see the original background has been removed completely. The checkered pattern indicates transparency. Click on the instant alpha tool in the tools palette. Instant alpha is an erasing tool that has similar qualities to the magic wand selection tool. Click on the color you want erased and simultaneously click and drag outwards to increase the erasing tolerance, or inwards to decrease. The results will be seen in real time as you drag inwards and outwards. As you can see in the above image, the green background is removed leaving transparency. 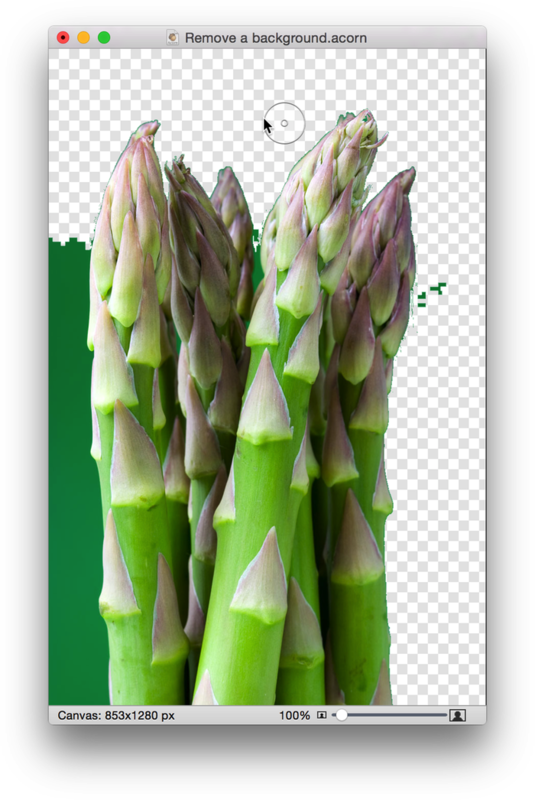 This is because there is no layer below the asparagus to show through the erased green area. Go to Filter ▸ Color Adjustment ▸ Transparentomatic. Click once on the color well to the right of where it says 'Color to Remove'. This will bring up the colors palette. 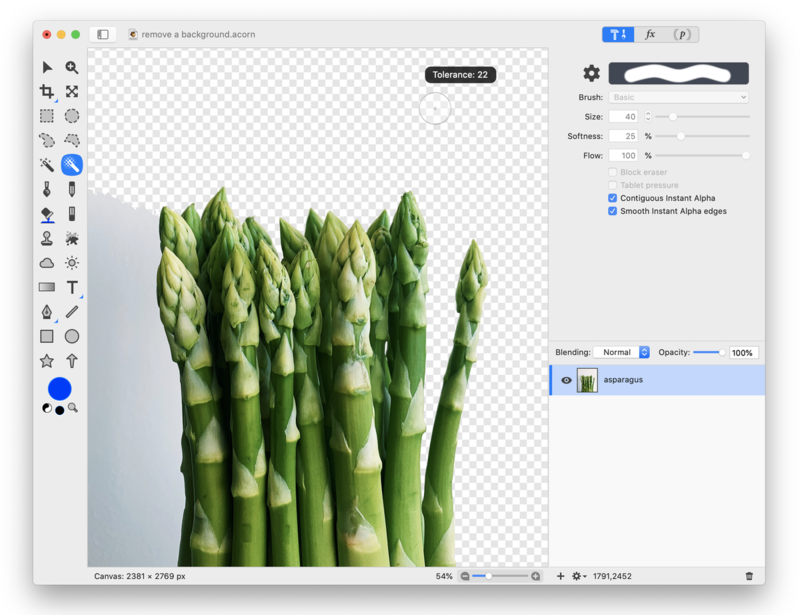 Click on the magnifying glass to the left of the colors display in the colors palette. Using the magnifying glass click on the green background in the image. The green background will be removed. Play around with the tolerance level of the filter until things look right. Go to Filter ▸ Color Adjustment ▸ Replace Color. Click once on the color well to the right of where it says 'Color to Remove'. This will bring up the colors palette. Click on the magnifying glass to the left of the colors display in the colors palette. 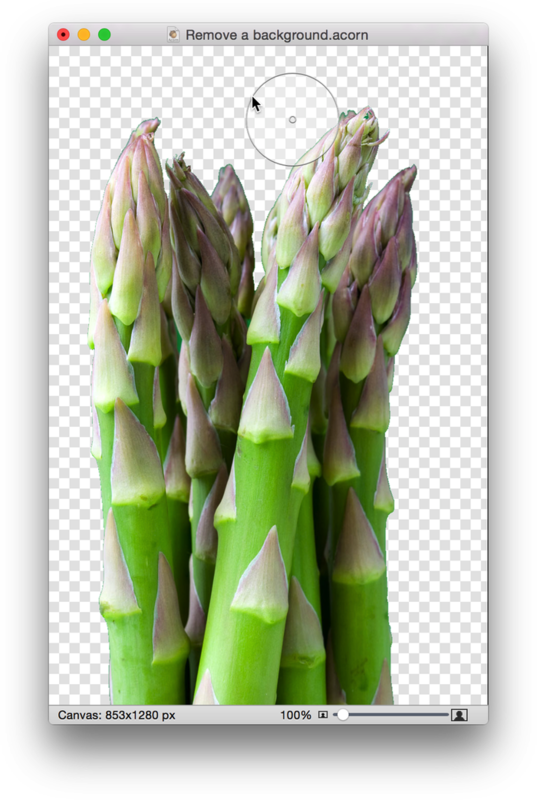 Using the magnifying glass click on the green background in the image. The green background will be removed and replaced with whatever color you choose to have in the 'Color to Replace' color well. Play around with the tolerance level until things look right. Select your background using the magic wand tool. Go to Layer ▸ New Layer with Selection. Deselect (⌘D). Now change the blending mode of the layer to Destination Out. 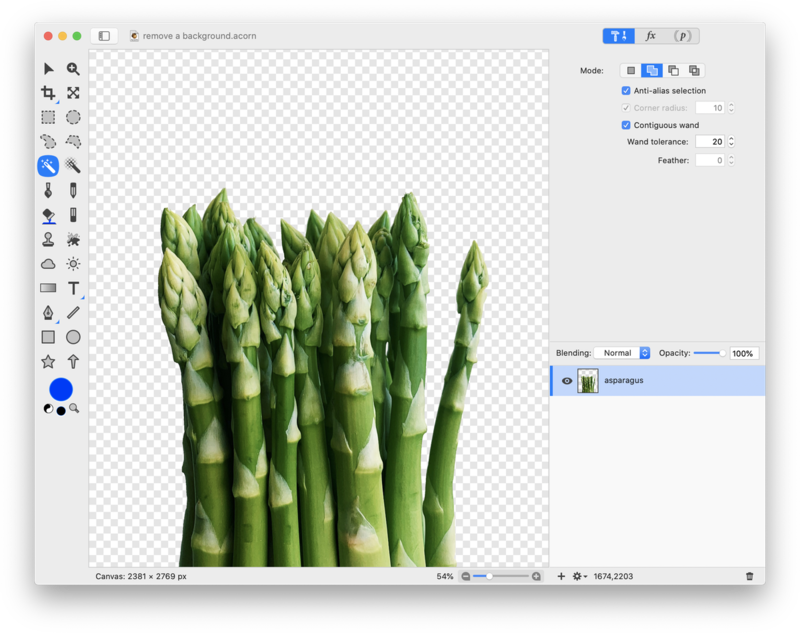 This will create a transparent background that is easily hidden or visible by turning the visibility of the new layer on and off.